Scientific Name(s): Caryopteris × clandonensis hort. Bluebeard is named for the shape and colour of the flowers rather than the grisly French folktale. 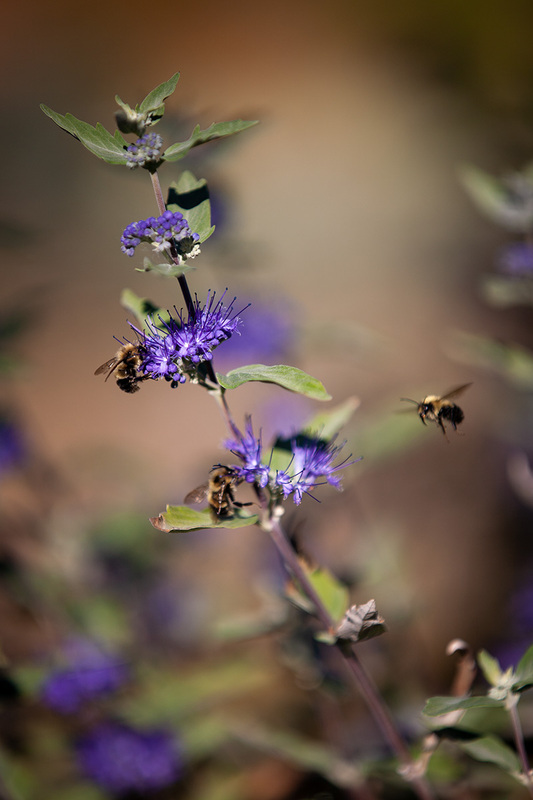 This visually-charming and bee-friendly shrub has found its way into many xeriscape gardens, including one at the site of today’s photograph, the Summerland Ornamental Gardens. Caryopteris × clandonensis is a name that was never validly published. Instead, it has origins in horticulture, and the name has persisted (see the abbreviation Hort., via Wikipedia). This hybrid taxon is the byproduct of a garden cross made in the 1930s between Caryopteris incana and Caryopteris mongholica, and it is now the most commonly-grown member of the genus. In addition to its pollinator-friendliness and suitability for dry gardens, it has scented foliage (similar to lavender) and a prominent spray of blue flowers (see a couple photos in the gardenscape). Cultivars of Caryopteris × clandonensis are often selected for differences in flower colour. In non-Botany Photo of the Day news, the paucity of entries lately is due in part to preparation for the American Public Gardens Association‘s Excellence in Plant Collections Management Symposium being co-hosted by UBC Botanical Garden. In addition to the events I am involved with for the symposium, my colleagues and I are also trying to complete a web site for exploring the Garden’s plant collections. It’s always a great surprise to get these photos – I’m happy each time you find time to post them. Arresting photo and excellent background as usual. I look forward to the new website. Those are wonderfully muted colors, and the bee activity really animates the photo. You never stop giving yourself new photographic challenges, do you? 🙂 I’ve been noticing Caryopteris down here lately, too – such a nice blue. Hosting the symposium must be a lot of work. I hope you’re able to enjoy the event. And the website – now there’s a major project! I helped out for a year or so at Bellevue Botanical Gardens with their plant records/GIS mapping project. I confess I never did understand the software. I mainly followed directions as to what to input, and was happiest when I could go out into the gardens and check to see what was right and what needed updating. Have you seen BBG’s map and collection search? I’m curious to know what you think about it, and what UBC is doing in comparison. Oh, there’s no shortage of things to learn in photography! The Bellevue BG site is excellent, particularly for those interested in gardening with the plants featured on the premises. As you’ll see very soon, our site uses the template from our collections management system, IrisBG. It will look similar to other Garden Explorer sites that you can visit from this page: IrisBG Users–click on any of the links to “Explore Plant Collection” beside the institution names (the Dawes Arboretum is perhaps the one that makes the best use of the customizable features). Thanks, Daniel, for featuring our Caryopteris x clandonensis and for the fascinating information about its origins. We are working to increase the pollinator appeal of our Ornamental Gardens and your photo testifies that C x c contributes to that goal. Another stunning photo of a very beautiful plant. it’s a gorgeous addition to any garden and all the pollinators looooove it. I always enjoy the photos and great background info you share with us.